BC has the financial means to make major differences in the lives of British Columbians. The most recent update to BC’s government finances shows a higher than expected budget surplus of $1.3 billion for this fiscal year. Even prior to the update, it was clear that BC has the economic and fiscal capacity to make significant investments to tackle big challenges facing our province, including poverty, climate crisis, housing, transportation and child care. Finance Ministry figures project substantial surpluses, forecast allowances and contingency allocations over the remainder of the three-year fiscal plan that goes until 2020/21. Together, these amount to combined underlying surpluses of $2.8 billion in the current fiscal year. Over the next two fiscal years, the underlying surpluses are projected at $2.1 billion in 2019/20 and $1.4 billion in 2020/21 (Figure 1). In short, the BC public treasury is flush. As I discuss below, this is in large part because—after a two-decade decline—public spending in the province remains too low as a share of GDP. A remarkably consistent feature of the BC budget process over the past two decades has been underestimating budget surpluses—often by well over $1 billion (see Figure 2). In 13 of the past 16 years, the predicted budget balance on budget day has been more pessimistic than the actual year-end balance, usually by hundreds of millions of dollars. The current fiscal year is shaping up to be another doozy, on pace to exceed the budgeted surplus by over $1 billion. The only three cases in which budget day projections were more optimistic than the actual year-end balance were in the wake of the global financial crisis (in fiscal 2009/10) and after the HST referendum when the government had to repay federal funds. We reject this overly cautious—and indeed inaccurate—approach to budgeting. When governments systematically underestimate the available budgetary resources, this distorts the scope of public debate on what a budget can actually achieve. The long-running, multi-government fixation on booking an operating surplus may make for good media headlines, but in economic terms, a small operating surplus is not meaningfully different from a small operating deficit. Precise budget balance is not a line of any economic significance. Source: Ministry of Finance. BC Budgets 2002 through 2017. 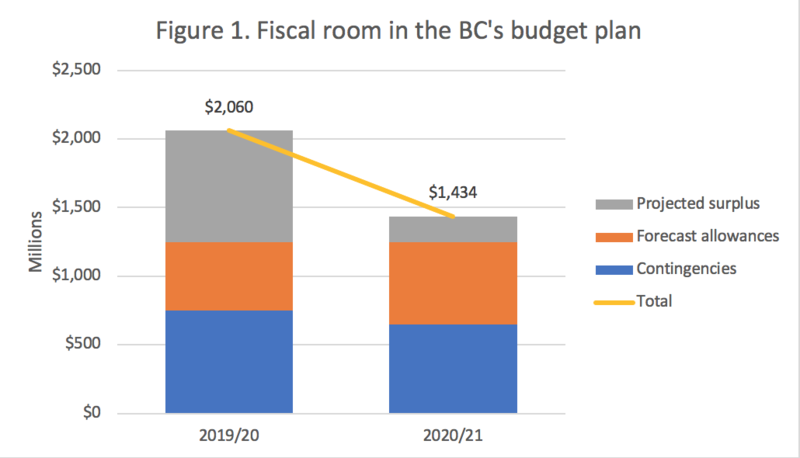 Ultimately, what matters for BC’s fiscal health is not whether a year ends with a budget surplus but the debt-to-GDP ratio (i.e., the debt relative to the annual income of the economy) and debt service costs (i.e., the debt interest payments relative to the size of the budget). BC’s debt-to-GDP ratio is projected to be a healthy 14.4% for 2018/19, down from the post-recession peak of 17.9% in 2013/14. It is also the second lowest in the country, which leaves considerable room for addressing a backlog of important capital investments throughout the province. Debt servicing costs are at historic lows with less than five cents of every dollar of revenue going to these costs. In its latest financial report, the government also trumpeted the elimination of “operating debt” in BC. Operating debt refers to a small subset of debt accumulated through past budget deficits. Most of our public debt, though, is taken on to finance long-term capital investments. Operating debt is not a particularly interesting or important category, but it’s impending elimination was promoted by the previous BC Liberal government and the NDP has jumped on the same bandwagon. When measured as a share of the economy, provincial operating spending has declined markedly since the late 1990s (see Figure 3). 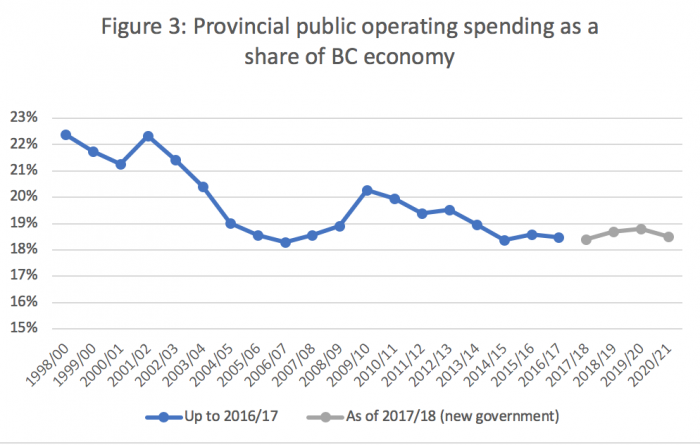 Under BC’s new government, this decline has levelled off but has not been reversed over the three-year fiscal plan. In concrete terms, if BC dedicated the same share of our forecasted $293 billion of economic output to public operating spending in 2018/19 as we did in 2000/01, we would have about $7.5 billion more available each year for additional public investments. So, it is entirely within our economic and fiscal capacity to make bold new investments in British Columbia over and above the important and welcome ones announced in Budget 2018. Source: Ministry of Finance. BC Financial and Economic Review and Budget 2018 First Quarterly Report. Several revenue measures have bolstered BC’s fiscal situation over the past year, including restoration of the top tax bracket on individual income above $150,000 to 16.8% and a one percentage point increase to the general corporate income tax rate (from 11 to 12%). The Speculation and Vacancy Tax and additional School Tax on properties over $3 million are also welcome steps in this respect. By requiring corporations and the wealthy to contribute more, these steps also enhance fairness in the tax system. The 50% reduction this year and forthcoming elimination of Medical Services Plan (MSP) premiums—BC’s least fair tax—represent a very positive step towards a more progressive tax system. The Employer Health Tax is a fairer replacement for MSP, but it is only projected to replace $1.9 billion of the total forgone $2.6 billion of MSP revenue. We recommend additional steps to fully replace this revenue, including a new top tax rate on incomes over $250,000, which can help ensure better-funded public services for all British Columbians. Given the pressing economic, social and environmental needs facing BC, as well as historically low interest rates, we also recommend the government increase borrowing to make additional public capital investments in affordable housing, transportation and to expand health and education facilities (including new child care spaces). These investments would strengthen the provincial economy and set the stage for future balanced and inclusive growth. We know that a strong, well-resourced public sector goes hand-in-hand with a healthy economy. In fact, it is often public investment that creates the conditions for communities and businesses to thrive. 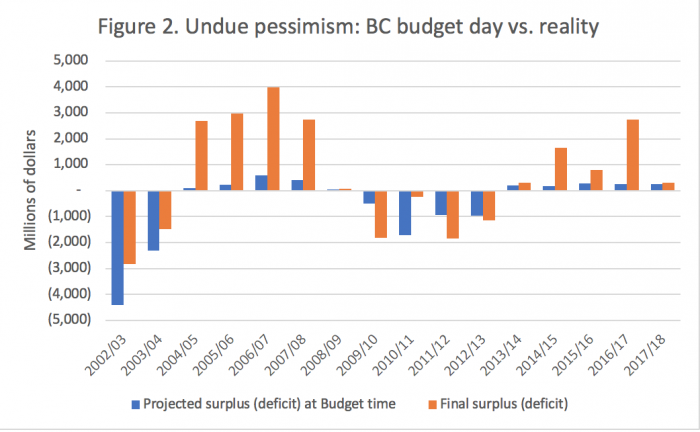 Assessing BC’s Fiscal Health: Can BC afford more deficits?